Arienne Landry in her domain at Just for You Cafe. "No whining." "We reserve the right to pour coffee on your cell phone." "We have different kinds of tea. Be nice and you may choose." At Just for You Cafe, owner Arienne Landry has been serving up the sass right along with the sausages since 1990. And not just sausages: the menu of this breakfast and lunch hot spot includes not only the traditional breakfast and lunch offerings such as eggs, pancakes, salads and mexican dishes, but also reflects the Cajun culinary background of this Louisiana native with such offerings as a creole crab cake sandwich, grits, gumbo and the special of the house -- beignets. But this is no greasy spoon cafe, Landry was on the slow food track long before it became trendy and her menu offers a wide selection of gluten-free options. The interior of the cafe is as colorful as Mardi Gras beads with its color-saturated concert, movie, and advertising posters covering the walls that feature such different subjects from the Smashing Pumpkins to Clint Eastwood and TWA Airlines to the Hells Angels. 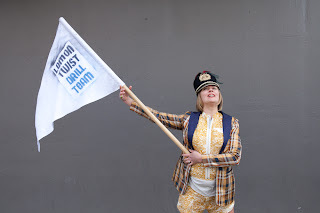 It's apparent from the efficiency and friendliness of the staff and the quality of the fare that Landry has figured out the "just for you" part of her business. And she has also figured out how to pay it forward -- Landry expects hard work and dedication from her staff but she also supports them in their own entrepreneurial hopes and dreams. Whether it be their own restaurant that they dream of opening or an unrelated business idea, Landry appears to not only encourage them, but also to give them the insight into what is needed to run their own businesses. In fact, Landry is currently allowing Guido, an Italian restaurant pop-up owned by one of her servers to do business after hours in her cafe. She is even there helping sometimes -- filling water glasses, giving out silverware or just encouraging the staff. 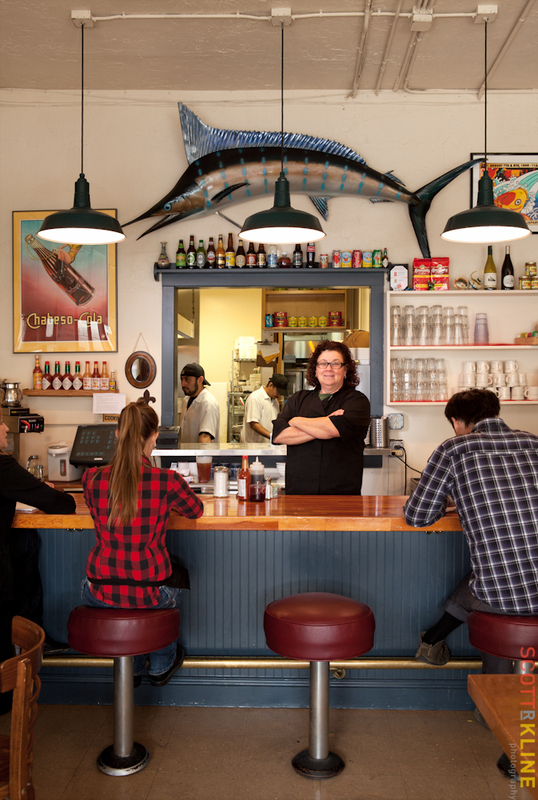 Landry would much rather be at the stove or razzing a regular but she did agree to chat with indogpatch a bit about how she ended up serving jambalaya and waffles in Dogpatch. Behind the custom counter she had installed. I love food and I love to feed people! I'm from Louisiana and after college I attended culinary school in New Orleans. Back then you didn't just go to school you also served an apprenticeship so by the time I was done with school I had three years of real restaurant experience. 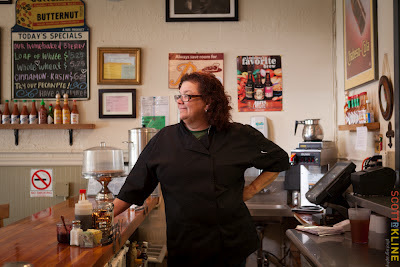 I apprenticed with the New Orleans chef, Susan Spicer, at her Savoir Faire restaurant. After graduation I headed to California and worked at several well-known restaurants including China Moon and Perry's Restaurant. I was also chef at Late for The Train restaurant in Menlo Park. But I'm an entrepreneur and risk taker at heart so in 1990 my business partner at the time and I bought Just For You located in Potrero Hill from the original owner who had opened in 1980. At that time we were located in a tiny spot that in New Orleans would be called a shotgun shack it was so small (current home of Chez Maman). 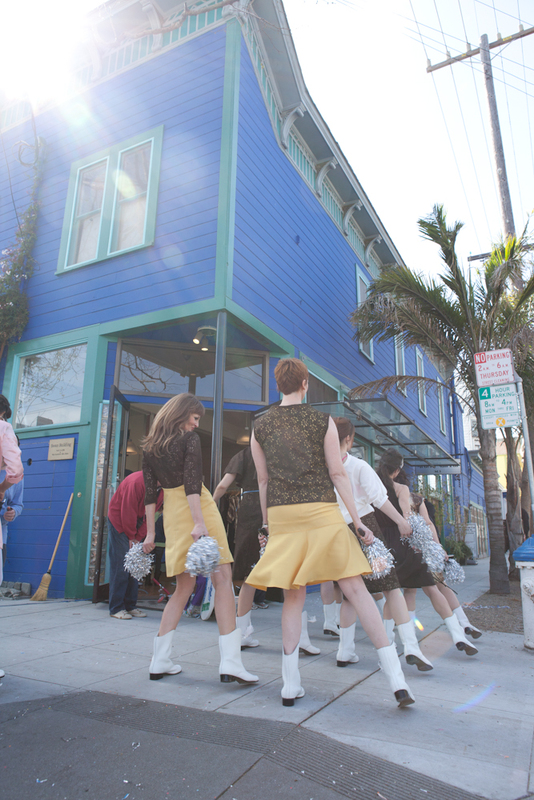 In 2002 we moved to our current location here in Dogpatch. I missed that wooden bar counter we had in Potrero Hill so I had one made for this spot! We got lucky when we found this spot even though it needed a lot of love and attention. It was a closed Chinese Restaurant and we got the space ready in only a few days. Now we had a lot more space to seat customers, a bigger work space and finally a fryer to make beignets. 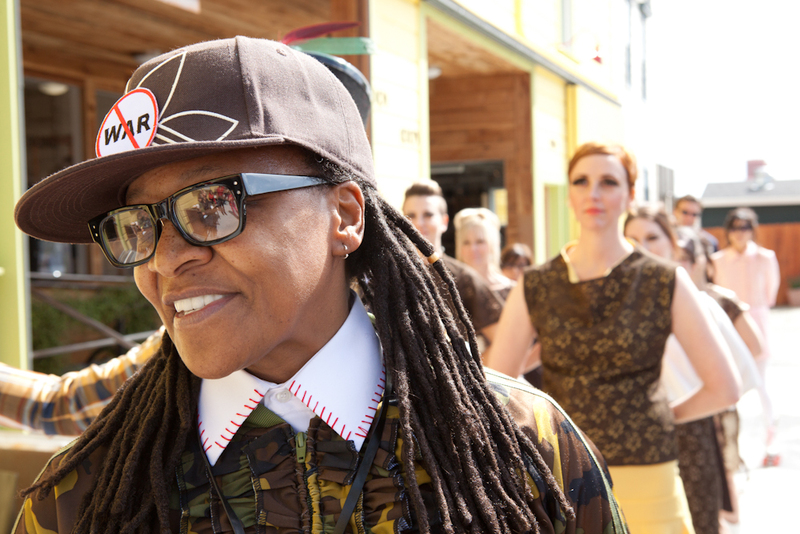 Who is another fascinating person in Dogpatch? Damian. owner of Reno's Liquor shop next door, is a real jokester -- loves to pull pranks. But I know he always has my back. Well, the headquarters for the San Francisco chapter of the Hells Angels is located right down the street. Several years ago Hells Angels from around the world came to town to attend the funeral of one of its members. We were full every day. At that time I had a Harley-Davidson Sportster I used to ride. I think they felt this was their kind of place. I would be a scientist looking for a cure for cancer! 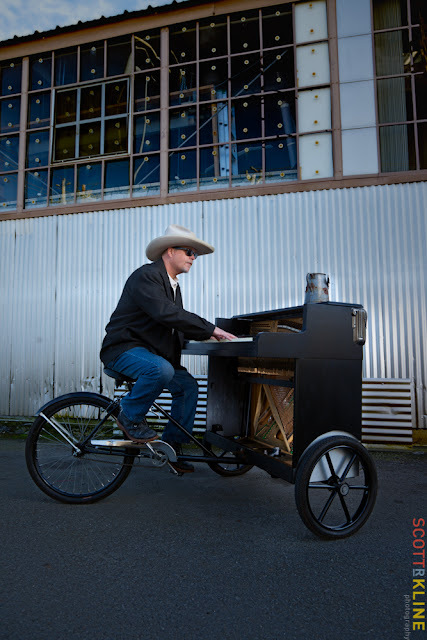 Gary St. Frankenstein on his Piano Bike in Dogpatch. 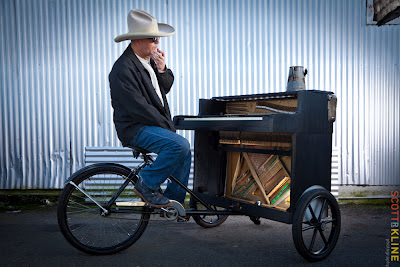 It's hard not to smile when Gary St. Frankenstein, wearing his trademark ten gallon hat and Ray ban sunglasses, pedals his pianobike around our Dogpatch neighborhood playing music -- the kind of music that makes you want to start clapping and bobbing your head. And maybe even dance a little. Gary and his bike have become a well known sight around the Bay Bridge, Ferry Building and sometimes outside the Giants ballpark. He has appeared in TV commercials and an independent documentary as well as recorded music for an ad agency's music catalog. Gary would rather his music and the spectacle of a piano mounted on a bike get all the attention than him. But we managed to get him to slow down and answer a few questions about himself and his piano. Well the short answer is I love to hear how the piano music sounds when it is played outside by the Bay Bridge and the Ferry Building. I love how the piano music blends with the wind, the fog and the boat horns. The longer answer is that I'm a self-taught musician and a veteran of several rock bands. The bands had record contracts with MCA and with Columbia Records and I spent more than seven years on the road touring with them as the piano or organ player. Although I loved it I eventually wanted to stop touring so I became a screen printer at a sign shop. I worked with metal and wood to fabricate signs. I loved my job but still wanted to make music but didn't want to go back to playing inside bars so I came up with the idea of a mobile piano. It took me two years to restore the piano and to figure out how to mount it on a bike. The bike is from a hot dog vendor. I worked on this project part time but lost my sign job several years ago. I decided to try to make my living again by playing music but this time I'm touring on a bike. 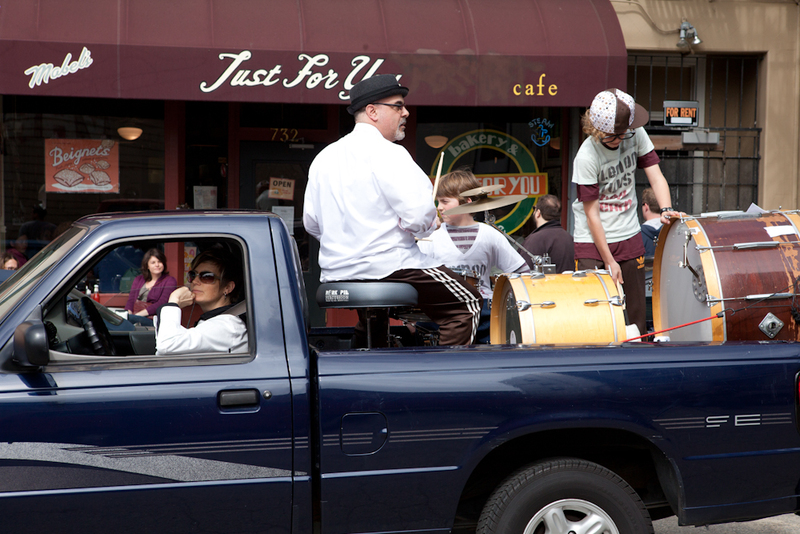 Even though I played in bands and toured, I was always the guy in the back playing the piano. So I'm not real comfortable being the one in the spotlight. The novelty of a piano on a bike takes the emphasis off of me. 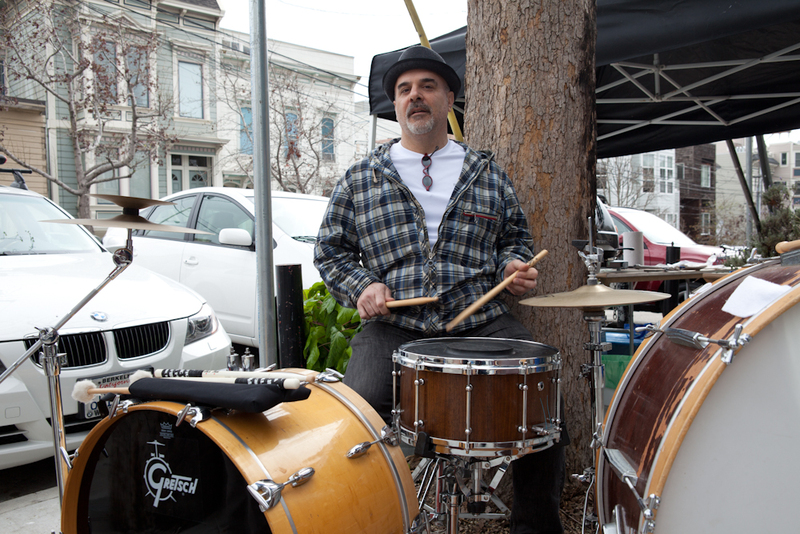 I play what I call saloon music or some call Ragtime because I hit a lot of pot holes when I'm riding around. That kind of music can take that kind of hit because it originated on old pianos that were hard to keep tuned. It was an acceptable sound for that old west era. My girlfriend and I really lucked out. 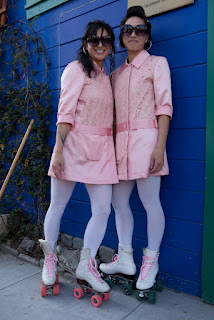 We are from small towns in Northern California and we always wanted to live in San Francisco. When we started looking seven years ago we found this little neighborhood. It was affordable but more than that it had lots of sunshine and felt like a friendly place. We feel like it is our own little corner of San Francisco. Who is another interesting person in Dogpatch? A person I still think about even though he has passed away is a homeless person that I had a lot of contact with over the years. I had never met someone who had such a genuine inability to be insincere. He really cared for people. I learned a lot from him. Well it may not be an interesting story but a memorable time for us in Dogpatch was to watch the activities that took place through the years at the buildings near our apartment. Dogpatch is getting cleaned up but it wasn't that long ago that hookers, drug addicts and other illegal activities took place pretty much around the clock there. We don't miss them! What would you be doing if you weren't a street musician? Once when I was touring with the band someone stole the organ I played. This was in Memphis. The police later found it in a bean field. I restored it and donated it to a local SF church where I play it for Sunday services. So, I guess I will always be playing music in some form. But I must admit that I loved my sign job. It used many of my talents and I wouldn't mind having that job back. And lastly, tell us about your name -- is it really St. Frankenstein? Actually, the name of my piano is St. Frankenstein -- so named because I took an old player piano that had been left for dead in a field and brought it back to life with pieces that I either made or found. It has only 64 keys instead of the usual 88 but it is the perfect size for the bike. My name is Gary Frank Skaggs. 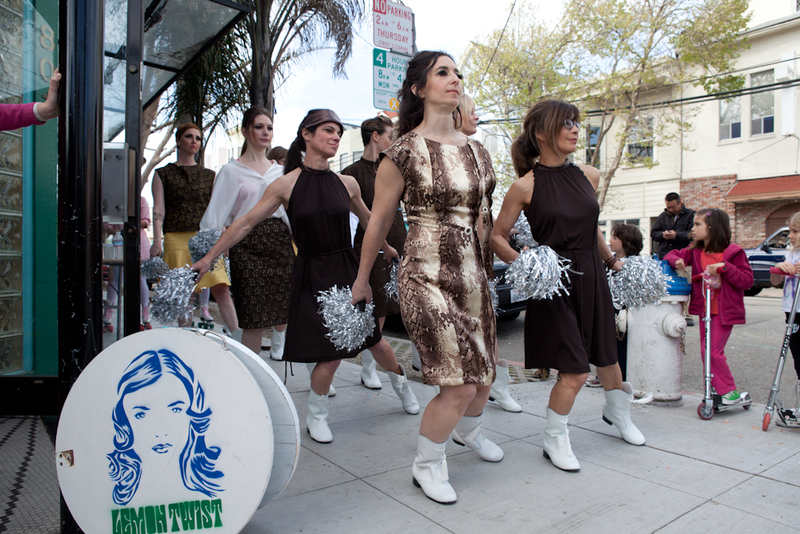 Sunday, March 11 marked the Dogpatch debut of the Lemon Twist Drill Team. 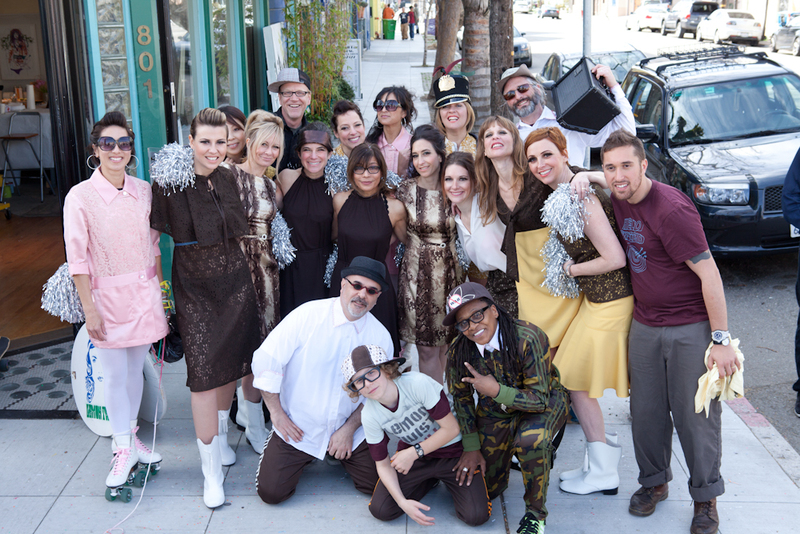 Outfitted and organized by Danette and Eric Scheib of Lemon Twist, the team prepped at the store on 22nd and Tennessee. Accompanied by Michael Recchiuti on drums, they marched toward Third Street and their first performance at Mr. and Mrs. Miscellaneous Ice Cream. The performance ended with a raucous routine at the Yellow Building before concluding back at Lemon Twist. One of the first items a visitor to Wayne Garcia's wine shop is a large "chandelier." Designed by Ingo Maurer and named Zettel'z Lamp -- German for piece of paper or note -- it sets the tone for a visit to Dig. Instead of crystal drops typical of a fancy chandelier, the lamp features pieces of paper clipped to thin wires. Some of the notes are preprinted and others have been left blank for the owner to fill. 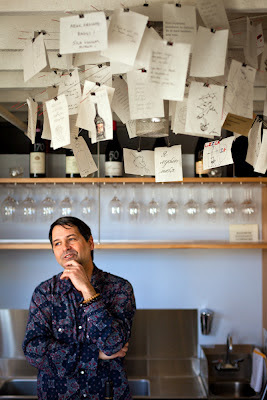 The lamp with the above quote by Bob Dylan and others scrawled or even drawn by customers and friends perhaps sums up Wayne Garcia, owner of Dig Wine located in Dogpatch's Yellow Building since its opening in 2011. Such a lamp tells the visitor that yes, wine can be serious business but it is also fun. 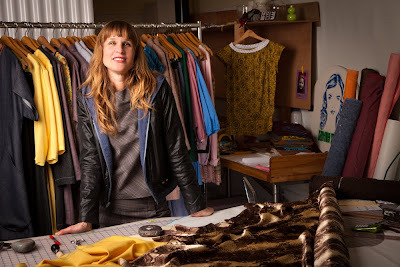 "It was a way for me to introduce a bit of whimsy into my shop. I'm highly opinionated about wine but I also wanted customers to feel that my shop and also me are approachable," said Garcia. Our conversation with Wayne not only touched on food and wine, but also spanned such topics as music, writing, architecture, James Joyce and type fonts leaving the impression of Wayne as a true Renaissance man. Wayne tries one of his beloved red wines. I love the intellectual challenge of selecting wine but I also love the sensual side. And I'm a big believer that food drives wine selection and that the best wine for food comes from France and Italy. That's why my shop primarily stocks wine from those regions. Wine has an image as being such a serious business but I view my wine vendors as farmers and as such I'm really drawn to where the wine comes from -- the land truly expresses the place where it comes from -- the soil, climate, everything. I'm always on the lookout for the most "sincere" wines that I can find! 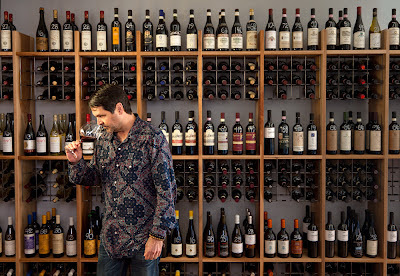 I've even been known to talk to my wines and tell them there are so many bottles that I didn't have room for in my shop that they better earn their place! So I love being immersed in this vocation at such a level. 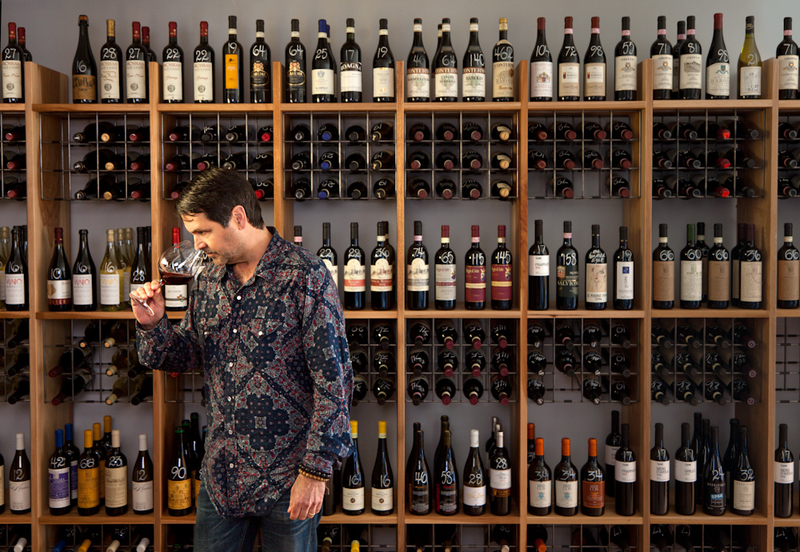 Ultimately I select wines for my shop based on what I would serve you if you came to my house for dinner. It might be a quirky selection but I remain true to my own palate. And I guess all that I did in my professional and personal life also brought me to this point of opening a wine shop. I've been an oil painter, a writer of food and music, I've worked with Ridge Vineyard owner Dave Bennion on his wine harvest and I've also traveled extensively in Europe -- all contributed to both my practical business side as well as the artistic sense that I think you need to have when working in the wine business. I even blame my current profession on my love of James Joyce's Ulysess and on the fact that my grandfather's breath smelled like red wine! My wife (Piccino Cafe co-owner Sher Rogat) and I love how Dogpatch has this reputation of one of the few places left in San Francisco where people still create things. And the neighborhood has such an eclectic mix of people from Muni drivers and Hells Angels to wine and chocolate makers. We love that. We also felt like we could add something to the neighborhood that wasn't here -- we liked the idea of a complex that brought together lots of vendors in one spot like you can find in many European cities. And that is what the Yellow Building has become as has this entire block with its mix of clothing shops, chocolate makers and restaurant. We have met so many cool people in Dogpatch but Michael Recchiuti, owner of Recchiuti Chocolates, is the first person to come to mind. His production facility is in the neighborhood and he is also opening a Chocolate Lab in the former Piccino Cafe spot on this block. He has such a refined palate but he is also a tough guy! And you won't find a more loyal friend. Well, this story is an example of the strong merchant ties that exist in Dogpatch as well as a place where cool new things are happening. Sher and I were looking for one more like minded business to join us in the Yellow Building. 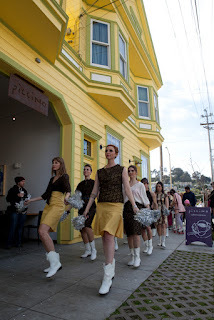 We had stopped in to an event hosted by another great Dogpatch chocolate company, Poco Dolce. While we were there Chris and Ben Ospital -- two of the sibling owners of the MAC Clothing shop stopped by and we discovered that they also wanted to open another location and wanted it to be in Dogpatch. We knew we had our third merchant and we spent the rest of the evening drawing up plans for how the merchants could be interconnected in the Yellow Building. What would you be doing if you weren't opening the door most mornings at Dig? I would be a full-time writer of food, wine and maybe music! And lastly, why the name Dig? This building dates from 1860 and when we started construction we quickly realized it was really just cobbled together with bits and pieces of a collection of items. So we had to take it down and start over at the foundation. We had to dig the cellar that is underneath the wine shop. I liked the notion of how digging a cellar was similar to digging in a vineyard. I worked with the amazing Sam Smidt who knows so much about typography to come up with the look of the name -- I like how it looks handmade and earthy! 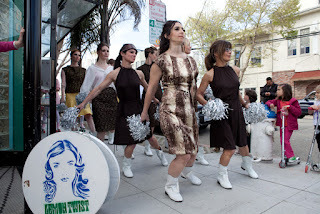 Since 1999 the husband and wife team of Eric and Danette Scheib have been the dynamic duo behind Lemon Twist -- a woman's clothing salon based in San Francisco. 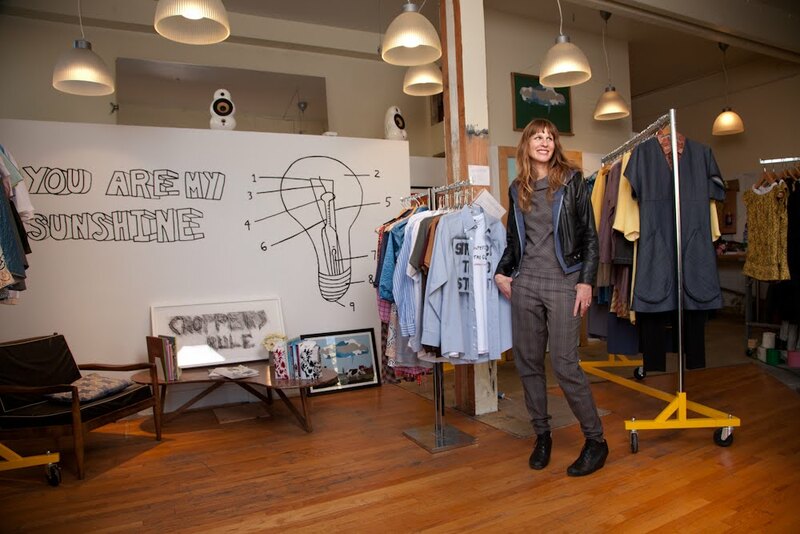 Not only are the clothes locally designed, but they are also sewn in San Francisco. After six years in Hayes Valley, they set up a temporary salon in Dogpatch on 22nd street in the previous home of Piccino Cafe. 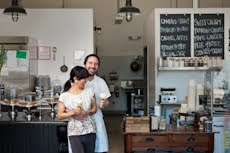 Dogpatch based Recchiuti Chocolates is planning a Chocolate Lab in that location but until he is ready to launch, owner Michael Recchiuti offered the space to friends Eric and Danette as their temporary location. When I started working in the design world I was always on the periphery but never the person in charge. And that was my choice -- I didn't want to be the boss! But even though I loved being in fashion and I loved my job as an assistant designer, I always felt frustrated. But once I took the plunge and was able to design what I wanted and to have all the creative freedom I needed I finally felt like I was doing what I was supposed to be doing. It finally felt like the right fit. Well, I always knew about Dogpatch and the yellow building (home of Piccino Cafe and other retailers) and knew that things were really cooking in this area. And we also were lucky to know Michael Recchiuti. 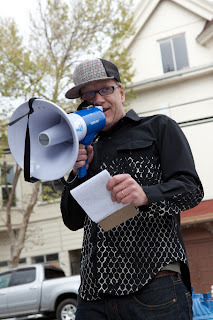 When we had to give up our Hayes Valley spot Michael offered us the blue building vacated by Piccino. We happily accepted and we will be here until April 1. Now that we are here we would love to stay in this neighborhood. We really feel that we are a good match with this neighborhood -- the residents get us! Who is another fascinating person in Dogpatch that you have met? I'm so inspired by Wayne Garcia and Sher Rogat (Wayne and Sher are the married couple who own the wine shop Dig and Piccino Cafe. Wayne operates Dig while Sher runs Piccino). 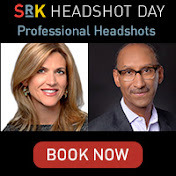 I'm inspired by how they are able to make their businesses and their marriage thrive. And of course Dogpatch has so many colorful residents -- I mean who doesn't love Gary the piano bike guy and Perry, who we call the unofficial mayor of Dogpatch and as such seems to know everyone in the neighborhood and is so generous about introducing us to everyone he knows! I think the real story for us is how the residents and other merchants have made us feel part of the neighborhood. People are always stopping by with tips for us on a new place to rent so that we don't have to leave the neighborhood. If you weren't doing this what would you be doing? I love what I do but I wouldn't mind a trip to Tokyo! The colors and design there would inspire me! And lastly, what is the story behind the name Lemon Twist? That little extra something added at the end to make it special. And speaking of something extra special, Lemon Twist will be putting their own twist on a customer appreciation event held March 11 by offering a Drill Team performance. Check out their site for more information. Danette shows the store near one of Eric's art pieces.